By now it should be clear what big William Tyler fans we are here at Deadquarters. We go to his shows on the reg, we sing his praises on the reg, we even put out a single for him. Just the same, there is no way we could have been prepared for what we experienced when Willy T did his first full band show last summer. 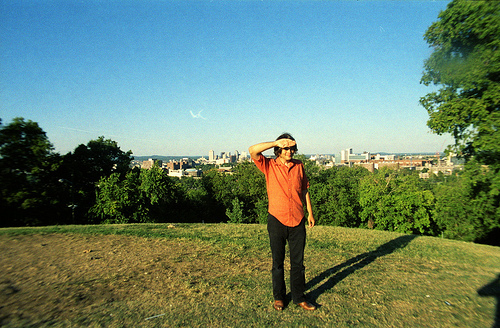 With the aid of the band [which features members of JEFF the Brotherhood, Natural Child, and more], William took songs we already knew, beautiful and intricate in their original form, and turned them inside out, shining light on dimensions of his playing and songcraft that we had never before noticed. It was unreal, and I stand by that it was the best show I saw in 2013. With all of that said, we were of couse delighted when word came that William would be releasing a 12-inch EP of recordings made with this same band. The record’s called Lost Colony, and it will feature one new song, one reworked song from last year’s Impossible Truth, and a Michael Rother [Neu!] cover. That new song, “Whole New Dude,” was just released as a teaser a couple weeks ago. You can listen to it below. Lost Colony is coming out though Merge Records on April 29. That’s Record Store Day if you don’t already know, so pick it up from your finest local brick-and-motar if you can. It’s also worth noting that William will be opening for Daniel Rossen at Mercy Lounge tonight. We haven’t heard anything about him having the band with him for this one, but it’s sure to be a great show regardless.